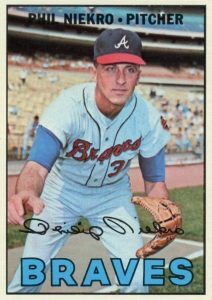 Phil Niekro was the king of the knuckleballers, winning more games over his career than any other knuckleball pitcher. With over 5,400 innings pitched, he bested every other player during the live-ball era. While Niekro made a career out of confusing some of the greatest hitters, you don't have to be confused by the hundreds of Phil Niekro cards available. This top list will point you to his best baseball card appearances from his 24-year career. 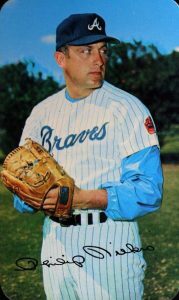 Niekro is best known for pitching the majority of his long career with the Milwaukee and Atlanta Braves. During the late 1970s, he was the franchise's main attraction. Along with his mystifying knuckleball pitch, Niekro was also excellent in the field, winning five Gold Glove Awards. 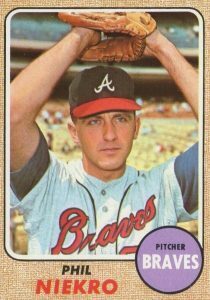 Along with his brother Joe Niekro, who was another knuckleball expert, the duo combined for a record 539 victories, beating brothers Jim and Gaylord Perry by ten wins. Niekro was elected to the Baseball Hall of Fame in 1997, becoming the only player selected that year. 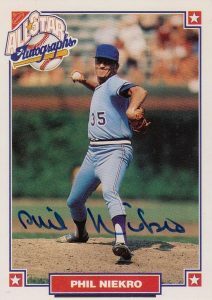 Shop for Phil Niekro autograph cards on eBay. This list is naturally dominated by Topps cards as Niekro's early career occurred during the Topps monopoly; however, there are also a few notable non-Topps releases from the early part of his career. In 1969, the famed board game-maker Milton Bradley issued a baseball-themed game that featured nearly 300 player cards, including Niekro. The cards were smaller in size and unnumbered with black-and-white photography that had the team logos removed from the player's image. Also in 1969, the MLB Players Association issued a set of player stamps to celebrate the 100th anniversary of professional baseball and collectors could also pick up a specially designed album for the set. Niekro made his Kellogg's trading card debut in 1973, which was the only Kellogg's release of the era that didn't use their famous 3D effect. Also an intriguing option, Phil has several cards in which he is featured with his brother Joe. They share a 1980 Topps NL Victory Leaders card as both brothers had 21 wins during the 1979 season. Later on, Donruss honored the brothers with two cards: one in the 1983 set titled the "Niekro Brothers" and another in 1986 Donruss titled "Knuckle Brothers." When the brothers became the winningest sibling combination in baseball history, Topps issued a Record Breakers card in their 1988 Topps set. Both brothers also have autographed cards in the 2001 Fleer Great of the Game set and collectors can find Phil Niekro autographs in more modern sets like 2016 Topps Museum Collection and 2016 Panini Flawless. Although Niekro was a no-brainer Hall of Fame selection, fans often put a premium on home-run-hitting sluggers and hard-throwing pitchers. This means Niekro's early cards can be found at budget-friendly prices. In building this top list, card value was the key component along with other factors such as card design. The 1970 Topps Super set saw the card size greatly expand while the checklist was cut down to just 42 cards. The cards featured rounded corners and glossy photographs on very thick cardboard, making them the highest-quality cards Topps issued that year. The unusual number of cards in the set created several short prints, however, Niekro's card wasn't one of them. Phil was coming off his best pitching season in 1969 when he went 23-13 and finished second in the National League Cy Young voting. The 1970 Topps statistical leaders cards gave you four players on a single card. Working out well for collectors, the NL Pitching Leaders card ended up featuring four future Hall of Fame members together. 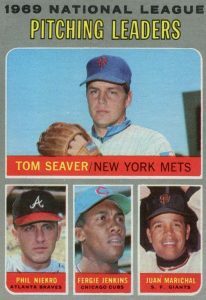 Mets' pitcher Tom Seaver towers above the other three as his 25 wins were the best in 1969. Niekro followed with 23 while Ferguson Jenkins and Juan Marichal tied for third place with 21 victories each. During the 1969 season, Niekro made the first of his five All-Star Game appearances. A popular recent Niekro autograph can be found in 2016 Topps Heritage High Number. The update set features on-card autographs from many retired players who were at the top of their game during the 1967 season. High Number uses the 1967 Topps design and offers players that were traded and late-season rookie call-ups. Along with the blue ink autograph featured below, Niekro's card also has a red ink variation that is limited to 67 copies. At the time of its release, 1969 Topps was the largest to date with 664 cards. The reverse side of Niekro's card highlights his team-leading five shutouts. Niekro also owns some interesting pitching records as he was the last to both win and lose 20 games in the same season, which he did in 1979. He also became the most successful older pitcher ever, winning a record 121 games after turning 40. Along with his 1968 Topps card that shows him beginning his windup, Niekro was also featured on a 1967 ERA Leaders card with Hall of Fame pitcher Jim Bunning. During the 1967 season, Niekro pitched roughly half his games as a starter and half as a reliever, finishing the season with a National League-leading 1.87 ERA. As is usually the case with knuckleball pitchers, success is often combined with struggles. While he had a remarkable ERA that year, Niekro also led the league in wild pitches with 19. Card #8 on the list also uses the 1967 Topps design, however, this is Niekro's official appearance in '67 Topps. This card remains popular with collectors as the entire 1967 release is one of the most sought-after from the decade. The reverse side of the 1967 set was the first time Topps provided the statistics vertically rather than horizontally. Niekro's card refers to his knuckleball pitch as the "butterfly pitch," which is an apt comparison as it is difficult to predict where a butterfly will land. Other nicknames for the pitch include the "flutterball" and "ghostball." 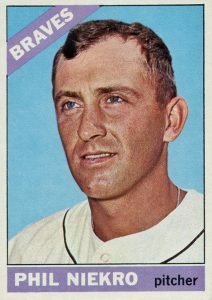 Niekro's first solo baseball card would come in 1966 Topps (continue down the list to learn why), which was a few years into his major league career. Although Niekro pitched for an incredibly long time, his career could have been several seasons longer as his first years were spent in the minor leagues. Signed as a free agent in 1958, he alternated between AAA and AA until 1964. Baseball historians have wondered if his minor league struggles were caused by catchers who failed to master catching the knuckleball, which is nearly as hard as throwing the pitch. I do wish I could go back in time and take advantage of the remarkable autographed cards that Nabisco began to offer in 1993. For just $5 and some proofs of purchase, collectors could scoop up an autograph from six Hall of Fame members including Niekro, Ernie Banks, and Don Drysdale. The following year, Nabisco again issued another set with six more stars for the same remarkable price, giving collectors the chance to rack up 12 autographs from baseball legends for $60. 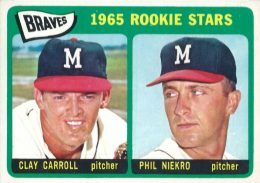 Niekro's first two Topps baseball cards are both combination cards with other Braves prospects and his 1965 Topps card is shared with pitcher Clay Carroll. Carroll would go on to become a two-time All-Star reliever for the Cincinnati Reds and would notch 143 saves over his career. Niekro's longevity (only three pitchers in baseball history threw more innings) was of course attributed to his mastery of the knuckleball, which didn't strain the throwing arm the way fastball or curveball pitches did. 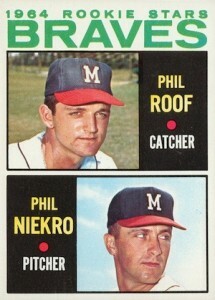 Another combo option, Niekro shares his 1964 Topps rookie card with Braves catching prospect Phil Roof. 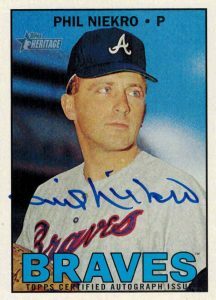 While Niekro would go on to set the Braves' franchise record by pitching in 740 games for the team, Roof would appear in just two games for the Braves before being traded to the California Angels in 1964. 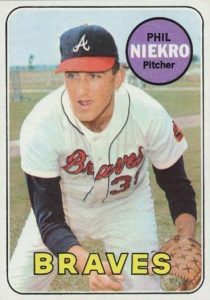 Niekro began pitching for the Braves as a reliever, making just one start in his first three seasons while accumulating eight saves over 79 appearances. Niekro's rookie is certainly his most popular card on the secondary market with near-mint graded copies topping $250 at auction and mint copies approaching $1,000.